Occly is a cloud-based workforce safety management solution which provides businesses with a suite of features such as live real-time images and video, team management, employee scheduling, real-time alerts, geo-fencing, way-point touring, workforce analytics, advanced reporting, and more. Occly enables users to manage their team in real-time with advanced metrics giving actionable insight into employee and business performance. As an online solution Occly supports a web-based portal and smartphone app, giving users the flexibility to manage workforce safety anytime, anywhere via any internet-enabled device. Occly can also include proprietary wearables. Occly supports a combination of technology including a cloud enterprise interface, smartphone app and wearables designed to help users manage workforce safety, monitor employees and lone workers, as well as manage risk and mitigate loss. 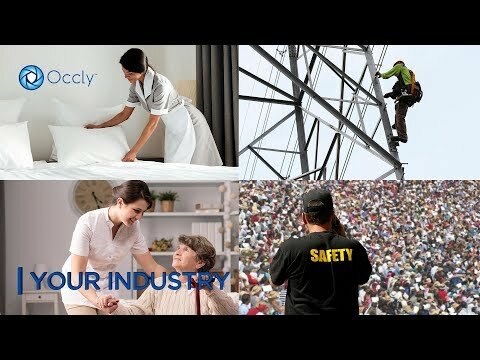 Occly supports a variety of industries, from construction and utility to property management, airport operations, education, delivery personnel, retail workers, campus security, healthcare, and more. Real-time image and video support enables users to see exactly what their employees are doing at any time, while scheduling tools allow users to create, track, and manage employee schedules conveniently online. Occly also supports 24/7 live monitoring, allowing users to monitor their team directly or via a professional monitoring team in the U.S.
Real-time alerts serve to inform users immediately during emergencies or with team-specific information. Occly provides the tools to manage permissions and alerts on the user-level. Historical data and cloud storage gives quick and central access to past alarm and user data, helping users stay organized and keep user data secure, as well as perform detailed analysis. Workforce analytics and advanced reporting tools help users analyze and optimize workforce performance, plus create incident reports with media attachments. Mobile field reporting allows users to log incidents on the go. Occly is customizable and supports communication services, allowing users to integrate employee or site phones with their business. Like it. Our employees are and feel safer. They are more responsibly with their time. All in all it makes our Office Management employees job easier and more affective. We deployed Occly to manage our people better and as a safety initiative. We have used it for approximately 10 months. We found that safety was only one of the ways we benefited from this product. Office Management is able to see where the employees are, what they are doing and what the status of each project is at. This helps with scheduling and planning of current and future projects. We were able to talk with customer service guys on the job. Great overall product to get a handle on your workforce. We deployed Occly to manage our people better and as a safety initiative. We have used it for approximately 10 months. We found that safety was only one of the ways we benefited from this product. Office Management is able to see where the employees are, what they are doing and what the status of each project is at. This helps with scheduling and planning of current and future projects. We were able to talk with customer service guys on the job. Great overall product to get a handle on your workforce. I wish it integrated with my payroll. It would be more convenient for billing hours at several different projects/locations. It was very effective of getting people to do what they are supposed to be doing. Helped weed out a couple of the bad characters. We are much happier knowing our staff have either the panic button or the wearable when at properties alone or late at night. Good for confirming OT. Tracking our building engineers was a hassle. The Occly workforce management software is a really good tool. We were able to identify when our guys were taking the opportunity to waste time. We were able to correct that. It is great for virtual time clock and remote workers. Tracking our building engineers was a hassle. The Occly workforce management software is a really good tool. We were able to identify when our guys were taking the opportunity to waste time. We were able to correct that. It is great for virtual time clock and remote workers. We use the software app and the wearable alarms at some locations. There are a lot of alerts that can be setup so if a user is not setup right, a managers phone will get a lot of alerts until setup right. Occly has been great along the entire process. We have had their help and support through the entire process. The software works great and the team is very open to feedback and making new enhancements when requested. I loved how easy it is to learn and use. This product met all of my needs. I loved how easy it is to learn and use. This product met all of my needs. The only con is that I didn't find them sooner. Occly offers a custom quote per software module and volume, plus any hardware expenses. Contact Occly for detailed pricing information. • Occly supports a combination of technology including a cloud enterprise interface, smartphone app and wearables designed to help users manage workforce safety and monitor employees efficiently. • Real-time images and video support enables users to see exactly what their employees are doing at any time. • Create, track and manage employee schedules conveniently online with Occly’s scheduling tools. • Mobile field reporting tools allow users to log incidents with media attachments on the go. • Occly supports a variety of industries, from construction and utility to property management, airport operations, education, delivery personnel, retail workers, campus security, healthcare, and more. Below are some frequently asked questions for Occly. Q. What type of pricing plans does Occly offer? Q. Who are the typical users of Occly? Q. What languages does Occly support? Q. Does Occly support mobile devices? Q. Does Occly offer an API? No, Occly does not have an API available. Q. What other apps does Occly integrate with? Q. What level of support does Occly offer?